Plesk is the control panel for your DV Server. When you newly provision or revert your DV to default, you will need to set Plesk up before you can begin using the interface. You can access Plesk from your AccountCenter. 1. Sign in to the AccountCenter and click on your primary domain. 2. Locate the Plesk panel and click on Change Plesk Password. 3. Enter your new password twice, then click Change Password. Please pay attention to the password requirements on the right. This will direct you towards creating a strong password. Each item must have a next to it before you will be able to proceed. 4. Click on Plesk Control Panel. 5. A new tab or window will open. If this is your first time visiting the control panel from this browser, you will see a certificate warning. This is normal. 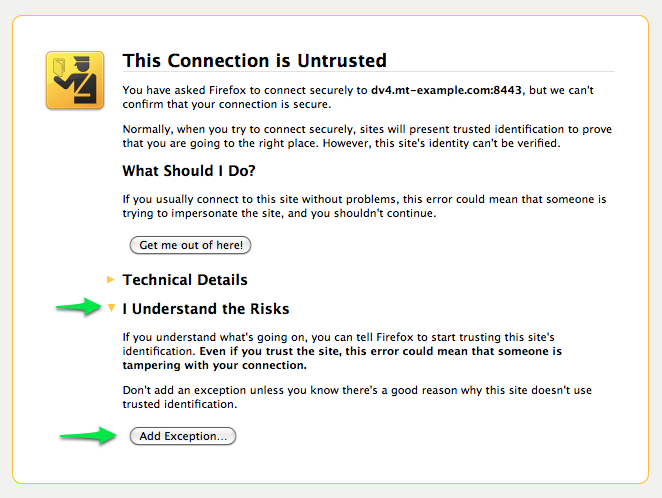 Plesk comes with its own certificate, rather than a purchased certificate, so the connection is secure but you will still see the browser warning. You should continue to the site. If you require a method to provide your clients with a URL that does not display this certificate warning, you may feel free to use the non-encrypted URL at http://IP ADDRESS:8880. You can also use the :8880 URL with any domain name that points to your server. Click "I Understand the Risks", then "Add Exception...". Click "Add Security Exception" to proceed. In Chrome, click advanced and then the Proceed to... link in the drop down menu. In Safari, you can click "Continue" to proceed. 1. You will now see the Plesk login screen. Fill in your username (admin) and the password that you set up in the AccountCenter. 2. Once logged in, you'll first be prompted to identify the purpose of your Plesk install. 3. Once your purpose has been identified, a second drop-down menu will emerge asking you select your preferred layout. This may be changed later. 4. Fill in your hostname, IP configuration, and admin password. Full hostname: Your primary domain should be filled in already. This is a good default setting. Default IP Address: Leave as default unless you want a different IP to be primary. New password: You must re-enter your password. Enter the same password that you did in the AccountCenter, if you want to stay synced with the AccountCenter. With Plesk 12.5, a strong password is required with your initial setup. These passwords are 8-15 characters long. Along with upper and lower-case characters, they require multiple occurrences of digits and special symbols. Such passwords provide strong protection from brute-force attacks. 5. Now, fill in your administrator's contact information. The email address listed will receive technical notifications from the Plesk control panel. 6. You'll now be prompted to create a user. It is strongly recommended that this user be given a different password than the root or administrative accounts. Plesk is now configured! Get started adding domains and applications as desired.